Not exactly a shelf-stable collectible, anyway. Oh yes, this is where we’re starting off. 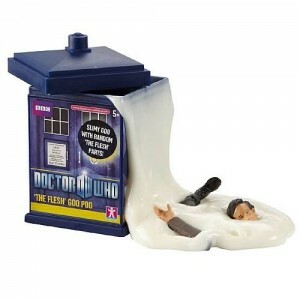 This toy is based on the “ganger” Doctor, a duplicate that appeared in the episodes “The Almost People” and “The Rebel Flesh.” He, like all the gangers, is made of a whitish goo, and reverts to that state when he dies. What that means, essentially, is that this toy depicts the moment of death of a character who’s identical to our hero. The site there postulates that this might have been a really strange way of recycling defective parts from Eleventh Doctor action figures, which if true is both ingenious and no less baffling. Who thought this was a moment that would make a good toy, anyway? That kids would want a dismembered version of their hero? It’s far from the only weird Doctor Who toy, with a Destroyed Cassandra coming in a close second. Star Wars is the series that basically started the action figure merchandising craze. When the second movie came out, toys started to get a little more… out there. The first Tauntaun toy, based on the beasts Luke and Han ride around on at the beginning of Empire Strikes Back, was just that: a mount your figures could ride on. 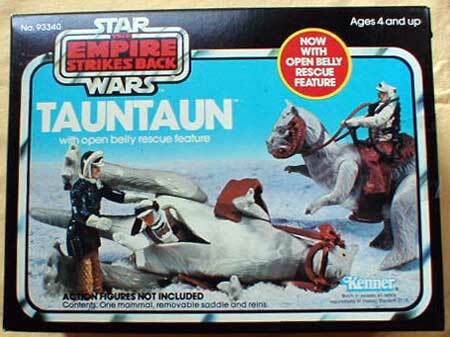 The second one, however, had an added feature: an open “rescue” belly, so you can stuff Luke inside the tauntaun corpse, just like in the movie! I guess we should all just be glad that it didn’t come with film-accurate guts and leave it at that. Yeah, one brown splotch on the side of his head ought to do it. One of the weird stories surrounding Star Trek Voyager is that of Harry Kim’s salvation from death. 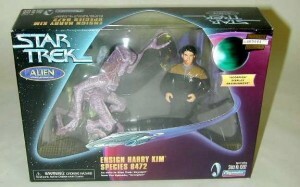 During a season finale, Harry was infected by these cells from the new aliens, Species 8472. He was supposed to die here, because the actor was apparently obnoxious on set and the writers didn’t really know what to do with Harry’s character anyway. But then he was named one of the sexiest men on TV, and so they sent Kes away instead to make room for Seven. Decently well known story, but consider what that means: when we see the infected Harry lying on a bed in sickbay, he was supposed to die there. And what better way to commemorate that fact than making it into a toy set? 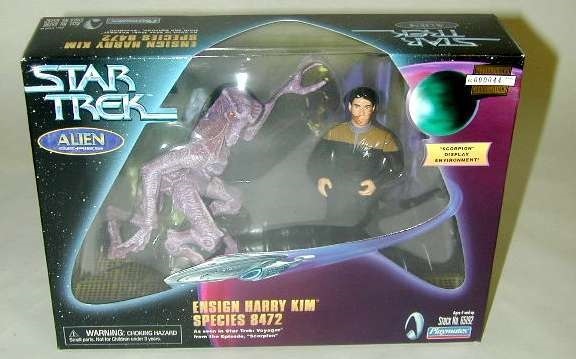 Never mind that the infection looks awful on the toy (not that it looked great in the show) and he looks more like he was pushed in the mud by Tom while on the holodeck. I have to wonder if they’d have still made this toy if Kim had died here, but with these kind of merchandise decisions, anything is possible. Special mention to the “Mutated Tom Paris” from “Threshold,” often hailed as the worst Trek episode ever which still somehow managed to get an action figure made. Mutated Janeway didn’t make the cut, so no reenacting that particular scene. 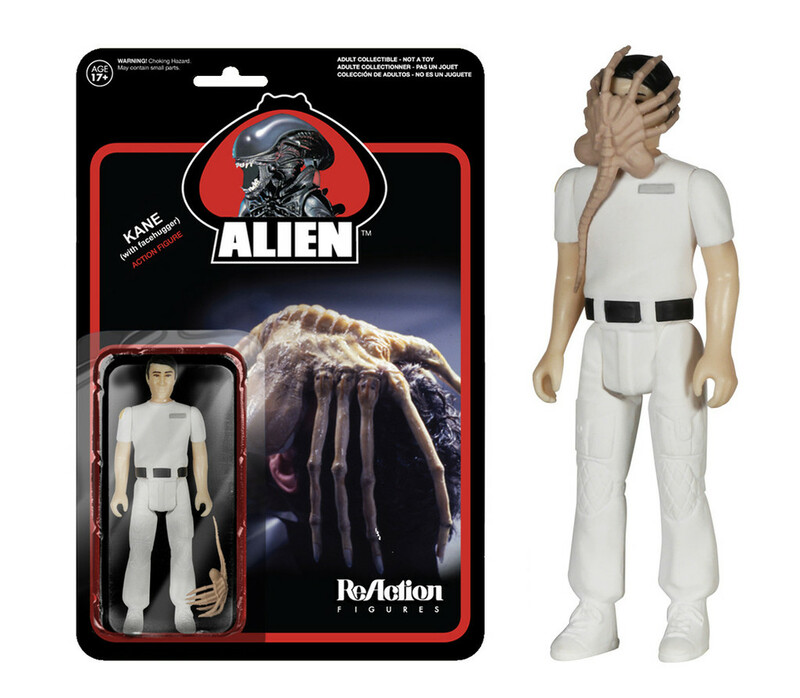 Now you, too, can attempt to remove the face hugger without ruining Kane’s head! While this toy isn’t exactly a toy for kids, Alien is a movie that shouldn’t have toys in the first place (and yet it does, and has since the 80s!). And as it turns out, they did, at one point, plan to make toys for Alien in the same way as Star Wars. Those plans were abandoned, until being found recently and finally distributed for the film’s 35th anniversary. 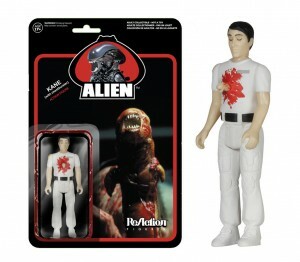 More toys inspired by the line were created, including multiple different versions of Kane, the poor guy who gets hit with the Facehugger early on. There’s also a chestburster, in case you prefer the scene where his chest is ripped open to the one where he’s suffocated by an alien’s reproductive system. While I’m sure that’s a lot of fun for fans, character deaths aren’t exactly toy material if you ask me. Any weird toys you know of that were based on scenes that absolutely weren’t toy-friendly? Let me know in the comments, or on Twitter @RetroPhaseShift.